The Calendar Creator has been updated to version 3 and has been released at the same time as the calendar grid for 2018. Everyone who purchased the Calendar Creator previously is eligible to upgrade for free to version 3 (also named Calendar Creator 2017). This new version contains bug fixes that were found in version 2, and a new permissions check. Permissions for distribution now must be no-modify only, but can be copy/trans if desired. If you have purchased any version of the Calendar Creator previously, you are eligible to receive the Calendar Creator with the 2017 Calendar Grid for free. Go to the redelivery terminal in the TD Creations inwold store to receive your upgrade. I have updated and expanded my previous picture frames. 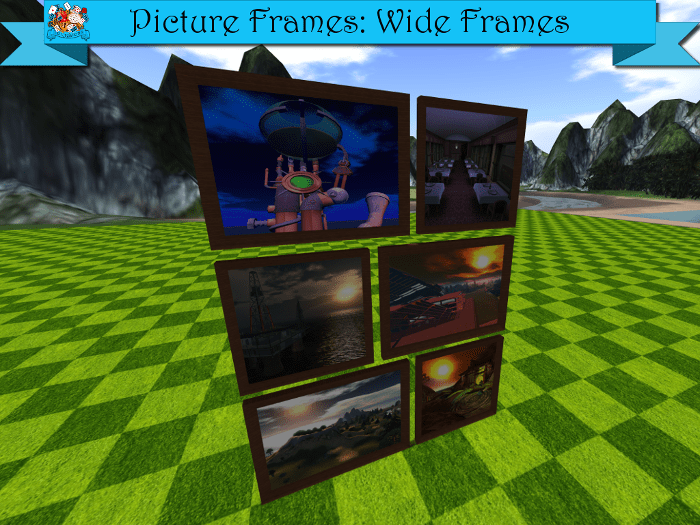 There are three separate types of picture frames: The matted picture frames, the narrow frames, and the wide frames. Each frame is 100% mesh and only half a land impact, so you can link two together and still only use 1 LI. 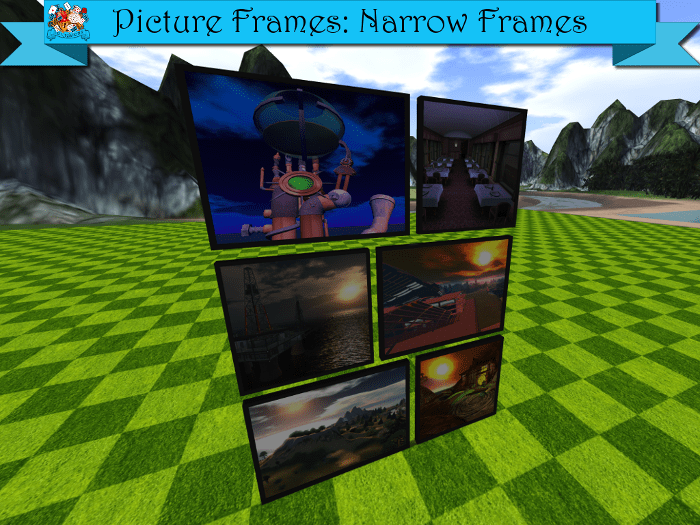 The frames include both 4:3 and 1:1 ratio frames, depending on your need. In addition, there are non scripted, fading slide show scripted, and standard slide show scripted frames. Since all the frames have copy/mod permissions, you can use as many of each type as you desire. 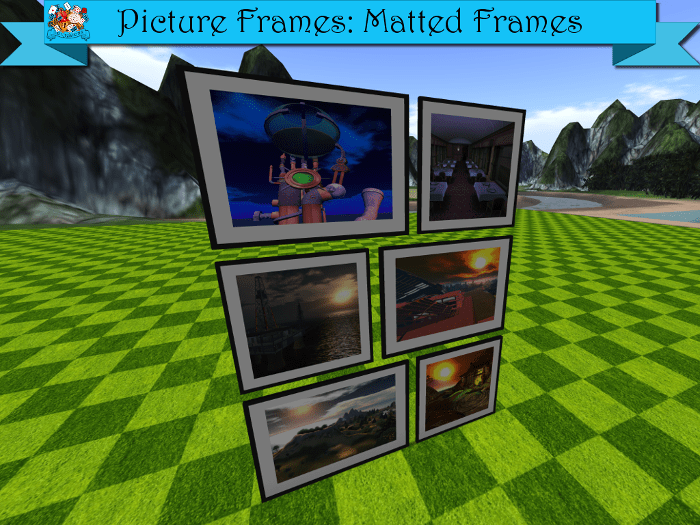 The frames are sold individually by style: Matted Frames, Narrow Frames, Wide Frames. They can also be purchased together in a discounted multi-pack. The first part to take place on the moon has been written in Lunar Penal Colony. I found out about these things on the moon called mascons that tended to occur in lunar basins. I couldn’t find a lot of information related to exactly how they worked on the moon, except they were gravitational anomolies that had caused satellites to crash and made lunar navigation difficult. It seemed like gravity in these areas were denser than other areas. So, it seemed only natural to choose one of these basins to put the penal colony on. Orientale Basin is a real basin on the moon, and naturally the name extended to to the station as well. As I think about it, the name Orientale Station is a much better name than Lunar Penal Colony. Perhaps that could become the name in the future, or something similar. I’ll have to see how the story continues to progress, to see if a better name comes up in the future. For now, the ugly name Lunar Penal Colony will remain. Waking up from a medically induced sleep, or would that be a coma, is not an easy task. Waking up from a medically induced sleep on the moon is even more disorienting. I don’t know how long I stayed in bed, just trying to focus and get myself oriented. The bed and pillow were quite soft. A warm blanket was pulled over me. It was very comfortable, unlike the stone beds I was on in the detention centers. Even the room I was in was completely different. For starters, it was an actual room, not a cell. I was in the twin bed, with the white sheets and light grey blanket. A simple white desk with a chair and a white desk lamp was next to the bed. A small tablet lay on the top of the desk. On the opposite wall was a wardrobe and dresser, also in white. Even my hospital gown was replaced with white pajamas. The bathroom, white of course, could be seen through an open door, contained a shower, sink, and toilet. A clock on the wall gave the time as 15:08. I had to think for a few minutes to understand that was three in the afternoon. My brain damage, combined with the waking from the sleep, made it difficult for me to do the conversion. Once I felt awake enough, I slid out from under the covers and stood up. The action felt odd to me. I don’t know how to describe it. Almost as if I were underwater, yet without the resistance of the water around me. When I slid out the chair to sit down and picked up the tablet, everything seemed lighter to my touch than I expected. I touched the screen of the tablet to turn it on. The image of a woman appeared on the screen, holding the tablet. She turned it around to show me the back of the tablet and pointed to a small circle in the back. “Please place the tip of your finger here to unlock the tablet.” Like the nurse, she had a kind voice and a very sweet smile. After she finished the instruction, the screen turned off. With a slight shrug, I found the circle in the back of the tablet and pressed my finger to it. The tablet flashed to life again, and the same woman appeared on the screen, smiling. “Good afternoon Val Edelstein and welcome to Orientale Station. This is one of four science stations on the moon designed to house prisoners from earth. This station is meant for those who have been sentenced for crimes of inconvenience, such as your inability to keep a steady job. We want to make your time here as comfortable as possible, but make no mistake, this is still a prison. You will be expected to follow the rules, and if you break them, you could be sent to one of the other stations. “There are a couple things you should know. We’re located in the Orientale impact basin, an area of the moon with a slightly denser gravity, but still half that of earth. That means it will take less energy for you to move or jump, as you’ll literally be lighter on your feet, and things here will feel half the weight as they would on earth. It will take some getting used to, but you should be adapted to the changes in a week or so. The woman flashed off the screen, and the desktop of the tablet appeared. The date and time indicated it was Friday, May 7, 2117, and was now 15:46. A schedule of upcoming events showed that dinner was in the cafeteria from 1700 to 1800, karaoke in Jupiter Lounge from 1830 to 1930, followed by lights out at 2000. A nice, albeit very white, room. A comfortable bed. A tablet of my own. Karaoke night even? This wasn’t a prison, this was a whitewashed resort with strict rules and curfews. If this is what it is like here, no wonder no one ever came back to earth. Who would want to leave this comfort, even if the decor was kind of plain. My story is finally about ready to go to the moon. Lunar Penal Colony Part 5 deals with the processing to get to the moon. Most likely, parts 2-5 is mostly going to get redone and significantly trimmed. There will most likely be certain elements that I will keep, possibly reordering the revealing of the backstory to coincide with things that happen during the processing. A lot of what was written was needless filler, just a way for me to keep things moving in my own mind. I’m sure there will be a lot of adjustments if and when I complete this rough draft. Still, I must say that I’m enjoying the writing process, and seeing these ideas being laid out, even if I know that some of it will be thrown away later. Two guards woke me up the next morning to take me from my cell. There was no breakfast waiting for me, nor was I given a chance to relieve myself. Get up, get moving, no time for anything else. I hadn’t eaten anything yesterday, and was sick after arriving last night. I was very hungry now, and my bladder was quite full. I didn’t bother to protest, though, because I knew it wouldn’t do any good. That, and I don’t like hearing the sound of my voice. The guards led me down the hall to a what appeared to be a full bathroom. There was a shower, a toilet, a sink, and even a large trash bin in the room. There was a seat in the shower, and a bar attached to the wall next to it. I hadn’t had a shower for several days. In fact, I haven’t even had a change of clothes. If I was going to be allowed to shower, that would be wonderful. “Take off all your clothes and put them into the bin.” I looked at the guard wondering if he was serious. Why would I throw away my clothes? And if I did have to get undressed, were they both just going to stand there and watch? “You heard me. Strip!” I could tell he meant business, and I certainly didn’t want him to get any angrier, so I did as I was told. “Now, use the toilet then sit on the shower seat.” I looked at the guard again. It was clear I would have no privacy at all. I sat down on the toilet and let my full bladder empty. The guard gave me a weird look as he saw me sitting, but said nothing. After I had wiped, I went over to the shower and sat down. The guard came over and cuffed my hands together, then attached the cuffs to the metal bar. I wondered how I was supposed to take a shower if I was cuffed to the wall, but again, I stayed silent. I could feel the blood rushing to my face. I was already feeling exposed with the guards, and now that I have a woman in here, observing my naked deformed body, it was quite embarrassing. “Val.” My answer was short and to the point, not wanting to say more than I absolutely had to. “What’s your last name, Val?” She made no comment about the ugly sound of my voice, as if it was just another perfectly natural voice, even though I knew it wasn’t. “Oh, it was yesterday. Happy birthday.” She gave me a good natured smile. Why would she say that? She was here to process me to go to the moon. She knew I was a prisoner. How could she really think my birthday would be anything even close to happy? I wanted to be hurt, upset, but the smile and sweetness of her voice was disarming, and I simply nodded with a half-smile in response. I looked at her in shock. She had been a prisoner, and now she was a nurse preparing me to go to the moon? It had to be some sort of a cruel joke. Yet the look in her eyes and the sincerity of her voice told me that she was most likely telling the truth. I couldn’t comprehend it. I didn’t ask anything else, so she began to do what she told me she was going to do. Using a sonic razor blade, she started at my scalp, slowly working her way down my body, letting the specially calibrated sound vibrations and laser swipes cut through all my hairs, leaving my body completely smooth and hairless. The shaving was a slow process, and quite uncomfortable, especially around my genital region where it was even a bit painful. She apologized for the pain, as she finished doing her job. Then came the shower. The head of the shower detached, and she was able to hold it in her hand. She told me to close my eyes as she sprayed the water over me. The water had a strong odor with it, which must have been the disinfectants and anti-bacteria mix in the water itself. When all was said and done, I was dried off and, as promised, escorted to the medical bay. I hated being so exposed as we walked down the hall, but I knew there wasn’t anything more I could do. “100… 99… 98…97…” That was as far as I made it. Part four of Lunar Penal Colony is finished. I’m not quite as happy with this part. I’m trying to move things to the moon quickly, but I think I might be just adding some pointless narratives right now. Showing the journey from the courts which will eventually lead to the moon. Almost felt like I was grasping at straws with this section. I’m guessing some of what happens between the courts and arriving on the moon will probably end up on the cutting room floor later. For now, I just keep things moving, and worry about cleanup later.